To increase speed of incremental backup of standby database, block change tracking should be enabled. A detailed explanation has been provided in the Chapter 3 regarding the block change tracking feature. To reduce the overhead of backup on the primary database, a standby database might be used to backup the database. You might be asked to recover the standby database using incremental backup of primary database during exam. To practice this case, disable shipment of archived log files to standby database, perform some log switched and delete archived log files from the primary database. Then take an incremental backup from the primary database and apply it to the standby database as shown in the following steps. As you see, we have missing archived log files that are not available at primary database. We either need to recreate a standby database, or apply an incremental backup of the primary database to the standby database. ► Stop the archive log apply process and remove archived log files from the standby database that were not applied. Create a table on the primary database, take an incremental backup and recover it on standby database. Query the table on the standby database. ACFS is an ASM based clustered file system that is used to store all type of data types and is installed with Grid Infrastructure. There are different ways to create ACFS. 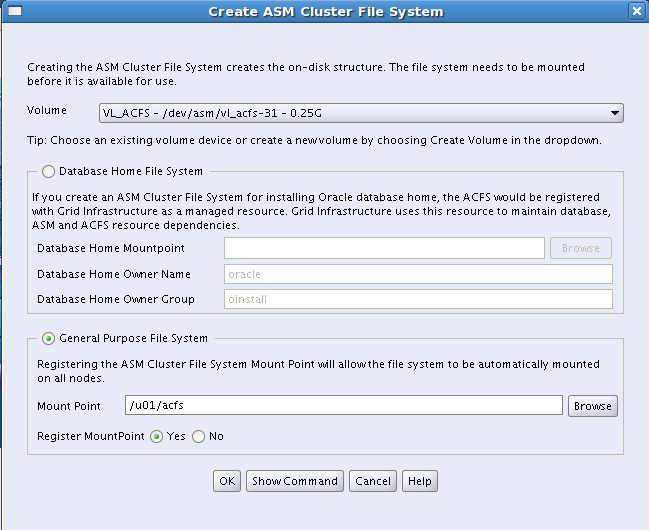 The way how to create an ACFS file system using ASMCA utility is shown below. ACFS is based on the volumes that are created in a disk group. So, first of all, an ASM diskgroup should be created. Then the volume will be created in an ASM diskgroup. This volume device will be used to create an ACFS. Before starting to create a new diskgroup, make sure you deleted all diskgroups that are created in the previous section. Run asmca command to open ASM Configuration Assistant page as shown in figure 7.12. Click Create button to create a new diskgroup named DF_ACFS with external redundancy and provide 2 disks as shown in Figure 7.13. Now switch to Volumes tab and create a new volume based on the newly created disk group as shown in Figure 7.14. Next, switch to the “ASM Cluster File Systems” tab and click Create button to create an ASM Cluster file system as in Figure 7.15. Click on “Show mount command” to see the command that is needed to run to mount the ACFS on other nodes as in Figure 7.16.
file in the ACFS folder, and create a snapshot of the filesystem. acfsutil snap create: Snapshot operation is complete. /u01/acfs2/.ACFS/snaps/ folder and all files are moved from the ACFS file system to this folder. To cleanup the environment or just to remove the ACFS file system, follow below steps. ► Create an ACFS file system using ASMCA utility ►10 min. ► Create an ACFS file system manually ►15 min. ► Deregister and Dismount an ACFS file system ►7 min. As it is seen from the output, the status of the cursor is INVALID_UNAUTH and the count of invalidations is 1. Perform the following practice in 15 min. ► Flush the shared pool, create a new table based on DBA_OBJECTS and gather table statistics. Query the table twice and get count of executions and invalidations from V$SQL view. Then gather a statistics again and invalidate the cached cursors and query V$SQL view again. Virtual Private Database (VPD) is used to prevent a user from access to unrelated data. VPD uses DBMS_RLS package that contains fine grained access control interface to limit specific data to specific users by applying the security policy directly to the database objects and modifies the SQL statement automatically before accessing the data by adding a WHERE condition that is returned from the security policy function. Let’s create a simple VPD and see how it works. Refer to the Chapter 7 under “Database Security Guide” documentation to get syntax of main commands. In the following example, we create a table (TBL_VPD_TEST) based on ALL_OBJECTS view under the new user USR_VPD, grant SELECT access to the second user USR_VPD_2 and create a policy to prevent the second user to query some rows.  Note: Please note that the preferred method to pass a session information to the function used in the policy is to use an application context. Detailed information is provided about an application context in the next chapter. Now DBMS_RLS.ADD_POLICY procedure to add fine-grained access control policy to the table. You can also specify rest DML command for the statement_types parameter like INSERT, UPDATE and DELETE. During an exam you might be asked to create a policy that must prevent a user from making an update that violates WHERE condition of the policy. In this special case, update_check parameter must be set to TRUE. To understand how it works, check the following example. The policy we have created earlier doesn’t contain update_check parameter and the default value of this parameter is FALSE. Using REMAP_DATA parameter you can apply a function to the rows that being exported and get a remapped data as a result. In the following example, we create a function that accepts a string as an input and converts the string to uppercase. Then we use this function with REMAP_DATA parameter and remap the characters of specific column of the table. In this section we will talk about SecureFile LOB (Large Object) segments. Detailed information about creating and managing LOB segments is provided in the next chapter. SecureFiles is a LOB storage architecture that is used to store unstructured data and contains numerous features as deduplication, compression, encryption and etc. If you want to store a LOB as a SecureFile, use STORE AS SECUREFILE clause in the CREATE TABLE statement. If you omit this clause, the LOB will be stored in a regular traditional way which is called BasicFile. – NEVER is used to make all LOBs that are created as a SecureFile to be created as a BasicFile LOB. – PERMITTED is a default value that allows LOBs to be created as a SecureFile using STORE AS SECUREFILE clause. – ALWAYS is used to make all LOBs in a ASSM tablespace be created as a SecureFile LOBs. – IGNORE is used to ignore store as securefile clause and creation of SecureFile LOBs are permitted. Note: Make sure the value of parameter DB_SECUREFILE is not set to NEVER and IGNORE if you are asked to create a SecureFile LOB during an exam. If the LOB segment is stored as a SecureFile, you will be able to use the following features. In the next newsletter, we will cover the rest SecureLob features. During an OCM exam you might be asked to convert a BasicFiles LOB to SecureFiles LOB. To perform this operation, you should use online redefinition feature. More detailed information about this feature was provided in the previous chapter. Check “Using Online Redefinition for Migrating Tables with BasicFiles LOBs” part of the documentation “Database SecureFiles and Large Objects Developer’s Guide – Chapter 4” to see an example related on how to migrate from BasicFiles to Securefiles LOB. Below, we will provide a simple example. In this newsletter I will show you how to create an encrypted tablespace. Any permanent tablespace can be encrypted to protect sensitive data. Tablespace encryption is completely transparent to your applications, and hence no application modification is required. It’s not possible to specify encryption for undo and temporary tablespaces, as there is no need to do so, because data from the encrypted tablespace is automatically encrypted even when written to the online redo log files, undo tablespace and temporary tablespace to maximize the security. Before attempting to create an encrypted tablespace, a wallet must be created to hold the encryption key, otherwise the following error will pop up “ORA-28365: wallet is not open”.